In 2018, Ariel David of Israeli newspaper Haaretz interviewed me about the death of legendary comic book writer/editor Stan Lee. In 2018, Danae King of The Columbus Dispatch interviewed me about a lecture I was about to give at the Columbus JCC in Ohio. In 2018, A.J. Frost interviewed me for The Beat about my work as a children’s book author. In 2017, Michal Shick interviewed me for the entertainment news site Hypable. In 2017, Allyson Gronowitz interviewed me for The Jewish Journal of Los Angeles. In 2017, A.J. 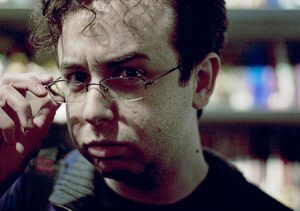 Frost interviewed me for The Beat, a geek culture blog. In 2016, I was interviewed by for the Comicsverse podcast by Comicsverse Editor-in-Chief Travis Czap, writer Kara Waltersdorf, writer and editor Jake Swirsky, writer Emily Coleman, and writer Cale Ward. In 2015, Patrick Hayes interviewed me for the website Sci-Fi Pulse. 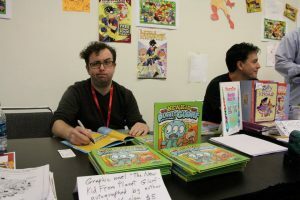 In 2015, Brian Delpozo interviewed me for the Comicsverse site, and we talked about some of the comic book stories I’d written for Bongo Comics and Dark Horse Comics. In 2014, Nell Minow interviewed me for the Movie Mom blog about my career in the video game industry and my work as an author. Here’s an interview (from 2013) with me and my colleague Jonathan Blitt on the Forces Of Geek website. In the interview, we talked to reporter Lauren Berkley about our work as writers on the television series TruTV Presents: World’s Dumbest, the web series The Real Male Escorts of Manhattan (we co-wrote & co-directed the pilot episode), and other projects. In 2013, I was interviewed by CNN.com reporter Todd Leopold for an article on Superman’s 75th anniversary. In 2012, Debra Rubin interviewed me for the New Jersey Jewish News about a lecture I was giving at the Highland Park Conservative Temple-Congregation Anshe Emeth. In 2007, Joe Eskenazi interviewed me for , the Jewish News Weekly, a Bay Area paper, about my then-impending West Coast lecture series. In 2006, Elizabeth Applebaum interviewed me for the Detroit Jewish News. In Comics, Villains Needed Article in the New York Sun about the launch party at MoCCA (the Museum of Comic & Cartoon Art) celebrating my 2006 book, Masters of the Comic Book Universe Revealed!